FV106 Samson is a British Army armoured recovery vehicle, one of the CVR(T) family. 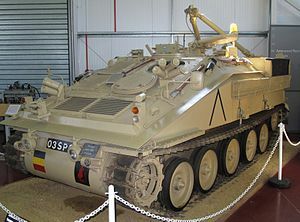 The main role of this vehicle is to recover the CVR(T) family of vehicles, but can recover other light tracked vehicles such as the FV430 series. The Samson was conceived in the early 1970s with the final design entering production in 1978. The hull is an all-welded aluminium construction. It usually carries a crew of three operating a 3.5T capstan winch that can also be utilised in a lifting configuration. It carries suitable equipment to enable a 4:1 mechanical advantage with 228m of winch rope. This winch is capable of recovering up to 12 Tonnes of vehicle. A manually operated earth anchor is situated at the rear to anchor the vehicle while operations are carried out. The Samson can be fitted with a flotation screen so it can be operated amphibiously using its own tracks at 6.5 km/h or at 9.6 km/h if also fitted with a propeller kit. The Samson can also be fitted with a full NBC protection unit. The REME Museum has an example of a Samson on display in The Prince Philip Vehicle Hall. Wikimedia Commons has media related to FV106 Samson. ^ Gordon L. Rottman (1 January 1993). Armies of the Gulf War. Osprey Publishing. p. 21. ISBN 978-1-85532-277-6. ^ Ministry of Defence (4 September 2014). "Latvian army purchases UK armoured combat vehicles". Gov.uk. Archived from the original on 29 September 2014. Retrieved 19 August 2017.